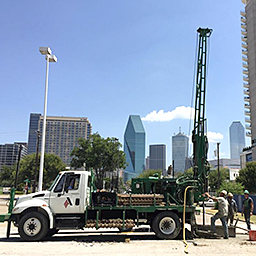 From low to mid-rise office space and retail, Alpha Testing geotechnical recommendations meet your business needs as well as site technical requirements. This approach can make all the difference to your next development, and is also found in our approach to environmental and construction materials engineering and testing. Hi-rise office and complex mixed use projects involve significantly deeper geotechnical drilling and extensive coordination with the design team. Drawing on experience from a large portfolio of office towers in Texas, Alpha Testing can perform all services with in-house personnel and equipment from our offices in Dallas, Fort Worth, Houston and San Antonio.